Getting a hotel in Lake Tahoe can be daunting. We have listed all major hotels in Lake Tahoe by city so you can check availability and book your reservations instantly online. This is the easist way to get a list of hotels in Lake Tahoe. The lake is over 72 miles to drive around. 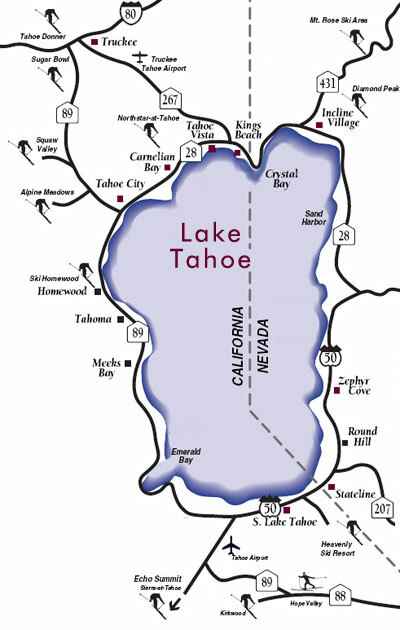 When you consider where to stay in Tahoe, you can see by the dividing lines where the boundaries are between North and South and California and Nevada. This map will make it easy to pick out the right area for you to stay in. If a vacation rental home or cabin is more your style browse through our Tahoe vacation rentals for choices that correspond to this map. You can see by the map exactly where the resorts are listed. Just click the resort and you will go right to the closest Lake Tahoe hotels or vacation rentals. This is a map of the Tahoe resort areas. Click an area to see hotels in Lake Tahoe for that particular area. It takes 1.5 hours to drive all around the lake, so choose the area that has the most activities you will enjoy on your vacation.